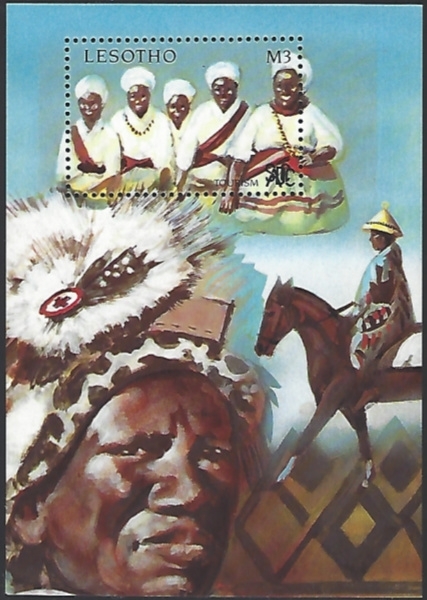 What is the Scott catalogue number of this Lesotho souvenir sheet? Not easy to find, but the best way, since it's a souvenir sheet, is to look through the listings for a souvenir sheet with a face value of 3M. Malawi changed its currency in 1980. So, starting from that point, the first souvenir sheet with a face value of 3M is #844. Now, the picture Scott gives of the stamps from the set shows two birds. One might be inclined to continue on, thinking that the souvenir sheet has nothing to do with birds, or the SADDC 10th Anniversary. However, the first word about the set in the explanation below the picture of the two birds says, "Tourism". The stamp on the souvenir sheet says "Tourism". Getting warmer. The identification of the 3M item in the set says, "People in Traditional Dress". There you have it. I'm not being a wise guy here. That's exactly what I did to find the catalog number for this souvenir sheet. I'm just offering a way to find a catalog number on a difficult item, and save some frustration.